Professor Emerita at Santa Fe College. Her topic: "The Constitutional Revision Commission"
I am a native Floridian who came to Gainesville in 1980. I have a BA in government from Barnard College and an MA in political science from the University of South Florida. I am ABD (all but dissertation☺) from the doctoral program in political science from the University of Florida. 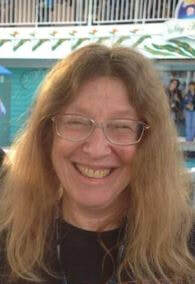 I came to Santa Fe College as a part-timer in 1985 and retired as a professor in 2012. My specialty is American Political History. Since then, I have taught part-time at SFC, but primarily teach at Oak Hammock, the Village, and most recently at the Senior Center. There, Shirley Bloodworth and I have launched at very successful Civics program, under the auspices of the Community Coalition for Older Adults and the League of Women Voters. I also work for the League as a Board member and the Speakers Bureau coordinator.